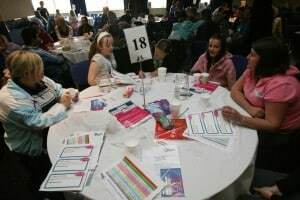 After months of preparation, 139 young people attended a participatory budgeting event in Newcastle in May 2008 to cast a 20% vote in the procurement of services for the city’s £2.25m Children’s Fund. This was one in a series of events held as part of the city’s Udecide participatory budgeting programme, which has given thousands of children in the city the opportunity to influence the allocation of £3.81m to improve the lives of their peers. Recognising that children and young people are the experts, the project aimed to give those young people in the city who were most likely to benefit from the Fund, the chance to have a real say in how it was allocated. The project also sought to demonstrate that participative approaches can be reconciled with complex decision making processes by integrating the popular Udecide method with the Fund’s procurement arrangements. Finally, by challenging providers to pitch their idea to young people, the project aimed to make them think differently about their services and how they involve young people. This project was also the first in the programme where the young people voting were not always direct beneficiaries of the project ideas, so the Udecide team were interested to see whether the young people would remain interested in spending decisions irrespectively. The project involved 450 young people at various stages of the process. These young people are often considered ‘hard to reach’ and came from a variety of settings – including a Pupil Referral Unit, a young carers group and a number of BME groups. Their enthusiasm and commitment has shown that with the right method, these young people are eager to participate, setting a new benchmark for the engagement of young people in the city. This case study was originally submitted to the Participatory Budgeting Unit in 2010 by the organisers of the project, using a template supplied by the PB Unit.